On 11 September, on matchday 7 of the Pari-Match League, the Pitmen faced Metalist. Mircea Lucescu fielded a full-strength squad except for Darijo Srna, who missed the game due to suspension. The captain was replaced at right back by Vasyl Kobin. 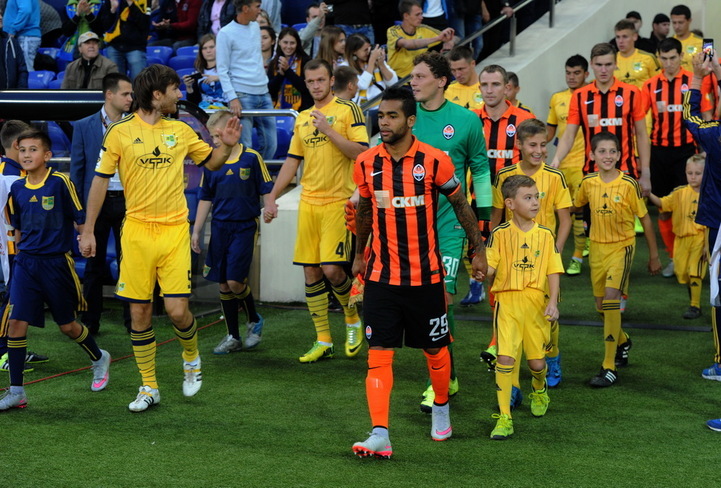 The captain’s armband was handed to Alex Teixeira. Shakhtar had solid support in the stands. The Pitmen tried to immediately take control of initiative, forcing the hosts to play on the counterattacks. In the opening stages of the game, Teixeira fired a dangerous low shot from the edge of the penalty area – the ball went wide. As the game progressed, Shakhtar’s dominance became overwhelming, the ball rarely left Metalist’s half of the pitch. There had not been chances for quite a long time, before Taison fired a powerful shot from the corner of the penalty area – the ball flew just wide of the far post. On 35 minutes, Yaroslav Rakytsky fired a brilliant shot into the top corner of the net. After some minutes, the Pitmen scored their second goal: Taison put Marlos through on goal, before Metalist’s goalkeeper beat the ball straight to Teixeira, who scored his eighth goal in seven games of the current league. Soon Alex again threatened goal again – the ball flew straight into the opposition goalkeeper’s hands. Shakhtar went into the half time 2-0 up. In the opening stages of the second period, Taison and Fred could have extended the Pitmen’s lead. Metalist had chances too. However, on 52 minutes, the Pitmen’s massive attack led to third goal: Rakytskyy delivered a cross to the far post from the left for Oleksandr Kucher to head the ball into unguarded net – 3-0. Soon Oleksandr Kucher saw his shot hit the goal post after trying to slot in a Teixeira cross. On 60 minutes, Teixeira again drilled a cross to Gladkyy, who was brought down by Ryzhuk. Metalist’s defender was sent off, and Alex confidently converted a penalty, scoring his ninth goal in the league. After that the Pitmen’s head coach Mircea Lucescu made a triple substitution, fielding Bernard, Ivan Ordets and Viktor Kovalenko instead of Marlos, Rakytskyy and Taras Stepanenko. The visitors’ dominance was still overwhelming , there were many chances, and on 80 minutes, after a great pass from Kovalenko, Gladkyy stilled scored, lobbing the opposition goalkeeper. Recently, the scorer became a father of the second son. In the stoppage time, Andriy Pyatov entered the game seriously for the first time, making two saves. Shakhtar got a confident 5-0 win. The Pitmen claimed their 16th point to level with the leaders Dynamo, who have one game in hand. Shakhtar will play their next game in Madrid against Real in the Champions League. After that fixture, the Donetsk side will face Stal in Kyiv.